This quote by Ibram X. Kendi, more than any other, is the driving force behind his second book Stamped from the Beginning: The Definitive History of Racist Ideas in America (henceforth Stamped). The title may be lofty, but it lives up to its claims. 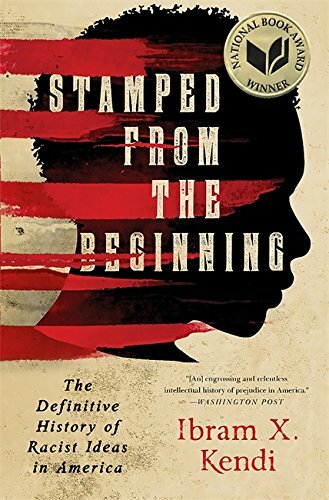 At over 500 pages, Stamped is thorough, comprehensive, and serves as an eye-opening exploration into how racist ideas developed, mutated, and entrenched themselves over time. With a work of this magnitude, Kendi spends an adequate amount of time explaining his approach and methodology for the book. First, he dispels the myth that racist ideas come first and lead to racist policies; rather, he argues that racist policies themselves produce racist ideas that hold the public in its sway. But what, exactly, is a racist idea? According to Kendi, it is “any concept that regards one racial group as superior or inferior to another racial group in any way.” And to Kendi, it is racist policies, put in place for economic, social, or political advancement, that leads to these concepts taking hold in society. Racist policies and their resulting ideas have shaped the United States since its founding, and even before. The idea that Black people—Americans of African descent—are inferior to White Americans of European descent has been integral to understanding race in this country, and the damage has been so great that even in a book of this size, the effects cannot be quantified. But Kendi, in scholarly brilliance, does his best to show just how ingrained these ideas are in the American mind. To analyze it, he argues that there are three approaches to racist ideas in America: the segregationist approach, the assimilationist approach, and the antiracist approach. For the segregationist, they believe that something is inherently wrong with Black people, so the races must be separate. The assimilationist, seemingly a middle ground, is no middle ground at all, however. They believe that there is something inherently wrong with Black people like their segregationist counterparts, but their solution to the problem is that Black people must become more like White people. Only the antiracist has the correct approach: there is nothing inherently wrong with Black people, and any problem we attribute to them as a whole is due to racial discrimination. This way of dividing approaches to racism should cause everyone to do some soul-searching. After all, who wants to admit they are racist? Certainly, not a White person who believes that America was racist once upon a time but is now a color-blind, post-racial society. Further, certainly no well-meaning Black person wants to believe that her own people are lazy, immoral, and given to all types of vices that would be remedied through hard work and “bootstrapism.” Nonetheless, Kendi holds everyone accountable for this. No one is immune from holding to racist ideas, whether they are a White progressive who tries to be an ally for Black social justice advocates, or even the advocate herself. And, as Kendi takes the reader on a tour through 600 years of history, he shows that even prominent figures like Frederick Douglass and W.E.B. DuBois can hold to anti-Black assimilationist racist views. This book is required reading because, no matter who you are, it will challenge you in some way. Kendi even admits that as he did research for the book, he was confronted with his own racist views about Black people that needed to be corrected. And, if an African-American scholar as brilliant as Ibram X. Kendi can see the racism in himself that needs to be expunged, all of us must go through the same process. Stamped from the Beginning will serve as a major paradigm shift to anyone who reads it and takes it seriously. Unfortunately, there are many who won’t bother to peruse its pages for a variety of reasons. The book isn’t for them. But if you care about racist ideas and their impact on African-Americans, whether you have a dog in the fight or not, this is required reading and will serve you well in your antiracist arsenal. Jonathan William is a student at the University of Central Florida studying hard to enter PA school. He currently hold an AA from Valencia College and is interested in literature, football (soccer for you Americans), and Catholic theology and practice.